We probably should have written earlier, but I am happy to let you all know that we have a new website- www.wineindulgence.org. Articles similar to those written on this blog will now be written on the site, as well as articles on events, wine producers, etc. We look forward to seeing you there!!! Basilicata, the region which is the toe of the boot of Italy, is an unsung area, that offers much more than many know about. It has a large coast line with blue water and long beaches as well as high hills and vast plains with various crops. Grapes grow everywhere, but the best grow in the area of Vulture, an ex volcano located in the center of the territory. The soil is rich and full of potassium, and the summer sun warms the earth and creates loads of sugar in the grapes, later to be turned into alcohol. 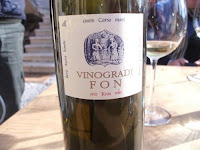 The fiano, a white grape probably more famous in Campagna, grows here alongside the aglianico, a dark red grape, which in recent years has grown in popularity and quality. 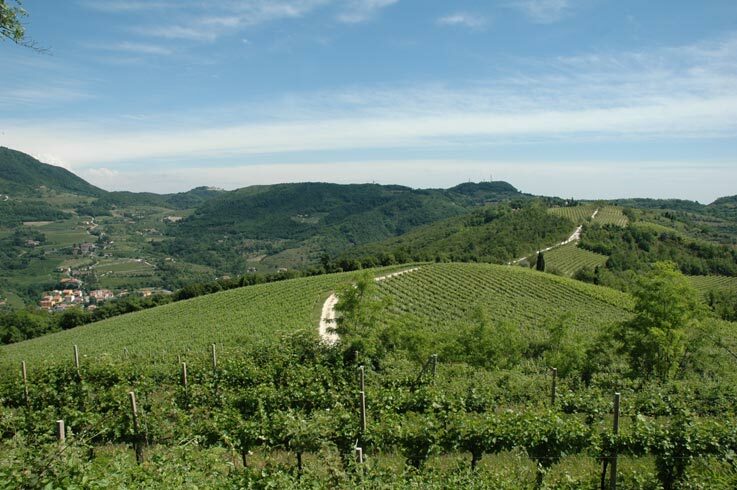 The Azienda Carbone, is a family owned vineyard which produces both these wines in the 10 hectares they own. Fiano's smell is light and fruity, long lasting and slightly sweet. Canteloupe, fig and baked apple, mix with cinnamon and spice. It really reminds me of an apple pie. The taste is slightly oxidized, a wine which may be better for after dinner, instead of during the meal. The minerals and salts remain on the tongue and mix with the metals which are the most prominent. I remember tasting it in the past at an event and remember something different. I think this particular bottle has oxidized, or in other words, some air has entered the bottle causing the wine to taste a bit like sherry. Unfortunately, these are things that can happen with all food, so I will rewrite about this wine the next time I open a bottle to see if the taste has changed. In the heart of Colli Eugani, we find Podere Villa Alessi, not just a vineyard but an agriturismo, or a farm with 15 hectars divided into vineyards, orchards and olive trees. These 'colli' or hills, lie due south of Padova and were once part of an active volcanic chain. The lava rock, now turned into soil, is full of nutrients and is rich in minerals. When the Romans started planting vines here years ago, they created wine that was known for it's great quality and taste. In recent times the tradition of making wine continues, with simple easily drinkable wines full of fruity taste. The Rosso 2008, is a ruby red mixture of over 30 types of grapes, many almost forgotten. The smell is meaty and tannic with an array of perfumes from violet flowers to cherry fruits and peppers. The slight time in the barrel also gives off hints of chocolate, leather and cloves. Many of these smells, like the fruit, spices and tannins, carry through to the taste, which is an important quality of the wine. It is also salty and mineral, an obvious characteristic due to the volcanic earth. There is a high quantity of alcohol, 14,5% which is a bit high for my taste and it is prominent in the smell and in the taste. It's interesting to see how so many grape types can be mixed together to create a wine that seems naturally put together. I think it's a good red for the summer, light and refreshing and full of fruits. The only way to taste this wine is to visit the agriturismo and enjoy a small vacation in the area. An hour drive from Venice, the farm has rooms to rent, a restaurant and a wine bar, for a quiet stay in the countryside during your time in Italy. Podere Villa Alessi agriturismo vini e fattoria! Il Podere ha una estensione di 15 ettari suddivisi in alberi da frutta, olivi e vigneto. Poggia su antichi terreni vulcanici. Come ben sappiamo la lava vulcanica è ricca di minerali quali potassio magnesio, silicio e quarzo ottimi nutrienti per la vite. La vite assorbe attraverso le sue radici i minerali impastati con l’acqua delle pioggie drenate dal terreno poi la linfa li porta al grappolo. L’agronomo dovrà fare la sua parte per governare i i tempi che la natura gli impone. Quando riesco a bere vini provenienti da zone vulcaniche il mio stato d’animo s’eleva forse perché sono figlio del magma terrestre e sento madre terra sconvolgermi tutto. I sapori e gli aromi hanno vita propria e se si ha poi la possibilità di sublimare il vino con la vista di queste colline ,Colli Euganei, allora abbiamo il top. Ora passiamo al vino Il Rosso 2008 fatto da un blend di 30 vitigni, entusiasmante! Il profumo nel bicchiere ricorda la frutta matura, la carne, il cuoio, il cioccolato e i chiodi di garofano. Il colore è un rosso rubino fitto e intenso. In bocca un buon frutto si espande sulla lingua, buona la trama dei tannini, ottima la speziatura. Ad un’ora da Venezia il podere Villa Alessi non può mancare tra i vostri prossimi itinerari. The hills of Soave have created wine for centuries but it's not until recently that the vintners from the area decided to create quality wine instead of quantity. 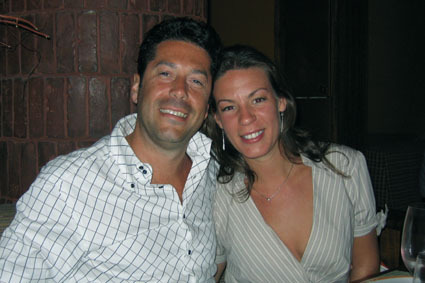 We've known Sandro, owner of Sandro di Bruno winery for awhile now and can easily recognize his wines from others because of its strength and character. The vineyard is still young, they only started in 2002, but the volcanic land where their grapes grow produces elegant yet intense wines. The Soave DOC that we drank a few nights ago, is a perfect representation of what a wine from Soave should be. The deep, golden yellow wine, opened with a fierce, smoky, lava rock smell. Behind it, was essence of apricot, red apple, pear, light honey and wild sage. The fullness of the apple proceeds onto the taste which is round and masculine. The hard parts of the wine, the salt and acidity, pair perfectly with soft parts, sugars and alcohol, creating a nice balance. The strength of the earth powers through into the wine and gives it a woody or aged in barrel taste, even if this wine was only put into steel. Unfortunately this wine doesn't sell in the US, but can be ordered and shipped anywhere along with a variety of their other wines. Le colline del Soave cullano i grappoli vino da tempo immemore ma è recentemente che la strada della qualità ha soppiantato quella della quantità. Conosciamo Sandro, proprietario della Sandro de Bruno Winery a Montecchia di Crosara provincia di Verona, da un bel po' e possiamo facilmente riconoscere i suoi vini da quelli degli altri dalla forza e dal carattere che hanno nel loro DNA. Il campo vitato è recente, infatti l'anno di nascita della Winery è il 2002 ma il terroir vulcanico di cui è composto il suolo si fa sentire e riconoscere nei suoi vini per eleganza ed intensità. Alcune sere fa abbiamo stappato il Soave DOC Sandro de Bruno, una rappresentazione ideale del Soave. Color giallo intenso con riflessi dorati, apre con un furioso e affumicato profumo di roccia lavica poi dietro lentamente si esprime la frutta di albicocca, mela rossa e pera con una lieve spruzzata di miele e salvia. La pienezza del frutto la si trova in bocca con un bel nerbo. Le durezze del vino: la sapidità e l'acidità si equilibrano armoniosamente con le sue morbidezze: l'alcool e gli zuccheri. La forza e la potenza del suolo fa sembrar questo vino affinato in botte invece ha visto soltanto recipienti in acciaio e il vetro della sua bottiglia. Da abbinare a pesce crudo magari con qualche salsa struttutata o a dei primi piatti di pesce. If you head east from Italy into Slovenia, there is a wild territory waiting to be explored. There are a few people who live in this area and most of them are farmers. Some make wine, mostly just enough for themselves and friends, and only one, bottles the wine. Marco Fon, is the entrepreneur of the area and he is the only one to sell his wine outside of Slovenia. His wine is hearty and thick, and it relates to the earth from which it is born. Terlan, a grape typical to the area, is the only red he has and it is completely organic, like his other wines. It's a dark, thick, purply juice with aromas that pop out of the bottle as soon as it is opened. Earthy smells, like a forest after the rain, are strange at first, but also inviting. Cacao, black pepper, cloves, juniper berry, and sugared blackberry and strawberry are some of the other scents. The taste is strong and powerful, and with 13% alcohol you can feel it. In fact, I think the 2009 is still way too young to be drank. The alcohol burns a bit in the mouth, and I think it needs time to blend with the juice. For Slovenian wine this is normal. These are wines that can last ages before opening, so if you do buy a bottle, wait a few years before drinking it. The other thing about this wine is that it has a high amount of acidity and salt, which not only keeps the wine from going 'bad' but also enhances the taste. If you do drink it in its youth, pair it with a dish that uses spicy tomato sauce. Se volete assaggiare qualcosa di atipico dovete andare in Slovenia. La Slovenia mi ha sempre attirato forse il suo stesso nome ma sopratutto le persone che ha conosciuto da quel paese. Il vino e' sinonimo di tradizione e qui molti contadini lo producono nei loro casoni e se lo bevono! Quindi è veramente da poco che si riesce a degustare il liquido di Bacco sloveno. Marco Fon, sloveno è un produttore, forse l'unico che riesca a vendere all'estero intendo tutta Europa e forse USA. Un appuntamento in una giornata di maggio tra due piccoli paesi, poche indicazioni stradali, molti passanti fermati. Finalmente a casa Fon incontriamo io personaggio schietto e giovane con la moglie al suo fianco. Dei suoi amici provenienti da Trieste sono presenti e quindi la degustazione si fa piu' accesa. Vini di Marco sanno molto della terra da dove provengono. Il Terrano, vitigno tipico della zona è l'unico rosso che produce completamente biologico. Si presenta con un mantello porporato a trama fitta e impenetrabile. Essenza di terra, terroso fino alle sue viscere. Come una foresta dopo la pioggia, distaccato al primo approccio ma invitante subito dopo. Cacao, more, chiodi di garofano, bacche di ginepro e altri aromi splendidi escono dal mantello . Il gusto è forte e potente. Credo che il 2009 sia ancora giovane da bere, l'alcool brucia un po' al palato e ha bisogno di ancor tempo per intrecciarsi al succo. Una grande acidità e salinità colpisce fuor di modo, amo questo carattere nei vini! Per un abbinamento,utilizzi un piatto con un sugho al pomodoro speziati. Greece makes a variety of wine, each slightly diverse from island to island. 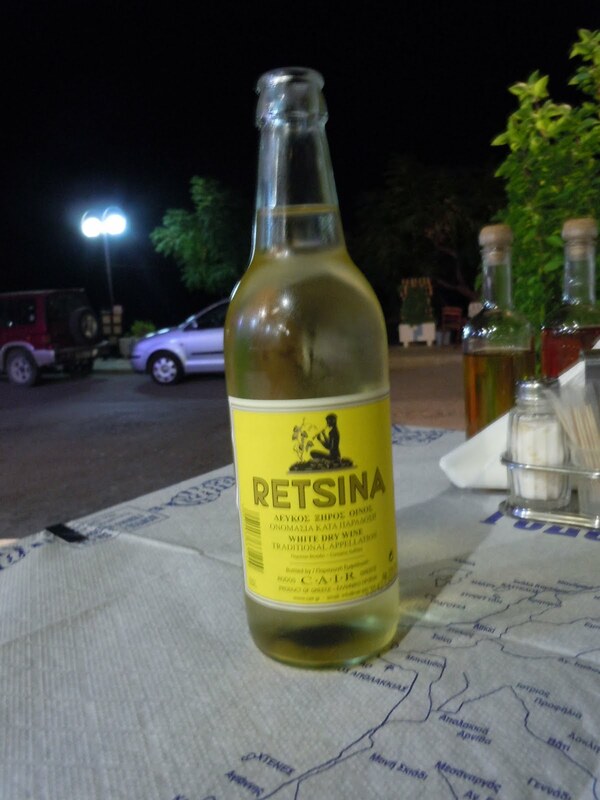 Retsina, a white grape and wine, is found almost everywhere and is super cheap to buy. In the restaurant we went to for our last night in Stegna Beach in Rhodes, called Taberna O Gialos, we drank a bottle for the price of 4,50 euro. 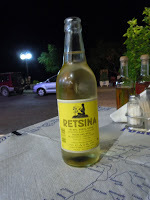 Our first reaction to the smell of Retsina was that it was slightly oxidized. In most countries this means that the wine got too hot, or too much air got into the bottle and destroyed the wine. In Greece, however, most wines have this slightly oxidized smell and taste, probably due to the excessive heat and is enjoyed like that. Overall, the smells were not too strong, a bit of lemon and wild herbs made it seem almost like dish soap. The lemon fruits carried through to the taste and combined with sage, thyme, bay leaf and mirto. It is a light wine, with only 11% alcohol, salty and slightly bitter. The food at the restaurant was much better. An antipasto of greek salad (a must), mussels saganaki- mussels in a tomato based broth with pieces of feta, and Taramosalata- a spread made with fish roe, which was excellent. The main course was a baked orata, cooked nicely and served with a lemon oil to drizzle over the fish. It was a great meal with a view of the beach and a few cats who joined us for dinner. In Grecia si possono trovare molte varietà di uve e come si può immaginare in ogni isola di cui è composto questo meraviglioso paese raccoglie piccole variazioni nel dna e nel terroir. 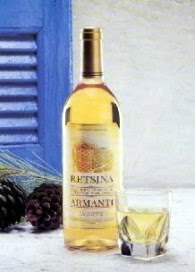 Retsina vitigno a bacca bianca si trova sparso dappertutto ed è veramente facile trovarla . Nel ristorante Taberna O Gialos dove abbiamo cenato durante il nostro soggiorno a Stegna nell'isola di Rodi una bottiglia di Retsina costava solamente 4,5 Euro. Versata in bicchieri da osteria con il vetro grosso, l'odore al primo impatto sembrava ossidat0. In molti casi questo effetto è causato dal calore al quale la bottiglia è stata sottoposta durante la sua vita o causato dall'aria incautamente penetrata nella bottiglia! Numerose tipologie di vino presentano questa impronta ossidata non per mancanza di cautele da parte dei produttori ma crediamo causata dalle temperature registrate in queste isole, al di sopra delle medie del continente europeo. Comunque il tono non era esuberante, combinato con le note di limone ed erbe mediterranee assomigliava vagamente al 'sapone per i piatti'. Il gusto di limone era molto consistente e faceva trapelare le erbe come la salvia, il timo, foglia d'alloro e la bacca del mirto. -Orata al forno servita con un dressing di limone ed olio d'oliva. Grande serata con vista mare. One of the participants at an event of ours, Vini Venturi, produces a variety of wines typical to the area in Marche where he lives. The Marche is home to a variety of verdicchio grapes, and the most famous of them all is the Verdicchio dei Castelli di Jesi. This particular wine can be classified as a classico (comes from the antique growing area) and superior (has a higher gradation of alcohol than the norm) as in this one by Venturi. Named Qudi, in order not to be confused with the normal verdicchio, is a dull straw yellow with 13% alcohol. A strong intense nose, it is filled with aromas typical to that of verdicchio. Honey, baked apple, lemon and pineapple mix with the chalky minerality of the wine. Sage and cedar sneak in too, and due probably to the alcohol, a sense of oxidation lingers also in the glass. Upon the first sip, an exotic fruit smell escaped instead of the apple we had smelled before. Grape leaf tastes also entered the variety of flavors in this historic wine. It was warm, round and full bodied, and tingled slightly in my mouth, probably because of the high concentration of acidity. Slightly bitter and salty towards the back of the tongue, we think it would pair nicely with a white fish baked in the oven with potatoes, rosemary and other herbs. Uno dei produttori che ha partecipato ai nostri eventi Vini Venturi, produce una varietà di uva tipica delle zona da cui proviene, le Marche. Stiamo parlando del Verdicchio e più precisamente del Verdicchio di Jesi. Questo vino può classificarsi come classico (viene da una zona vitivinicola dalle origini antiche) e superiore (ha una gradazione in alcool superiore al prodotto base). Il nome è Qudi per non confondersi dal Verdicchio base, ha un colore giallo paglierino intenso con una gradazione alcolica di 13%. La fragranza al naso è tipica del Verdicchio: miele, mela cotta, limone e ananas mescolata con un sapore gessoso proveniente dal suo territorio. Salvia e cedro si insinuano e si propone anche un odore di ossidato. Al primo assaggio il frutto esotico si spegne per lasciar spazio alla mela. Il sapore di foglie d'uva si sprigiona in questo storico vitigno. Caldo, rotondo e di corpo con un leggero pizzicore sulla lingua dovuto all'alta acidità. Leggermente amaro e salato come retrogusto. Lo vedrei bene con un bel pesce di carne bianca al forno con patate,rosmarino e timo. 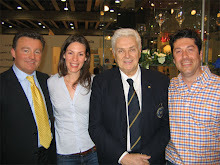 A.I.S Councilman Roberto Gardini, Dana, A.I.S. President Terenzio Medri, Paolo.